If I learned anything from hanging with friends and family during my family vacation in Florida, it’s that the majority of people don’t automatically reach for green juices or inspect labels to make sure everything is organic and has less that 10 ingredients. I forget this sometimes because I'm immersed in a place and in an industry where information and trends related to fitness, wellness and nutrition are prominent. Most people are just trying to get their kids to eat SOMETHING for breakfast before they rush out the door for work with a luke warm cup of coffee in hand. There are pros and cons to fast food: PROS: It’s fast. Duh. It sometimes tastes decent. CONS: It’s usually filled with processed ingredients, saturated fat and is super high in sodium. However, for those times when we’re in a bind, it might be the only option. So, I took one for the team and taste tested several nutritionally-decent fast food breakfast menu items and rated them for you so next time you’re on a road trip, stuck in the airport or didn’t have time for that egg white omelette before work, you know what to order at your local Mickey D’s. 1. Panera Avocado, Egg White and Spinach on Sprouted Grain Bagel Flat: This was my favorite sandwich and the one I would pick first. The bagel flat was really delicious and there was a nice serving of egg whites, topped with spinach, tomato and avocado. It tasted like something I would make at home for breakfast. Take off the top bagel flat to reduce the calories and carbs. 2. Panera Egg and Cheese on Brioche: This brioche is so. Damn. Good. It’s buttery and yummy with the cheese. Although, I prefer some greens in my breakfast sandwich and with my eggs, so I would prefer some spinach inside like the first option. 3. Starbucks Sous Vide Egg White Bites: These are so yummy. I’ve actually had these several times when I’ve stopped in for coffee and didn’t have time for breakfast. They’re super convenient because they’re little tiny egg bites, and sooo delicious. They have cheese, red bell pepper and green onion baked in to a tiny little egg bite (it actually takes about 5 bites, but you get the idea). *tip: Ask them to toast them twice for a nice golden crunchy outside. 4. Starbucks Protein Box: I LOVE this snack box, and not just for breakfast. I pick it up when I’m traveling because there’s always a Starbucks and it’s filled with a variety of simple, nutrient dense snacks (that just so happen to be great for breakfast). It has two hard boiled eggs, grapes, apple slices, cheese, raisin pita and Justin’s peanut butter. 5. 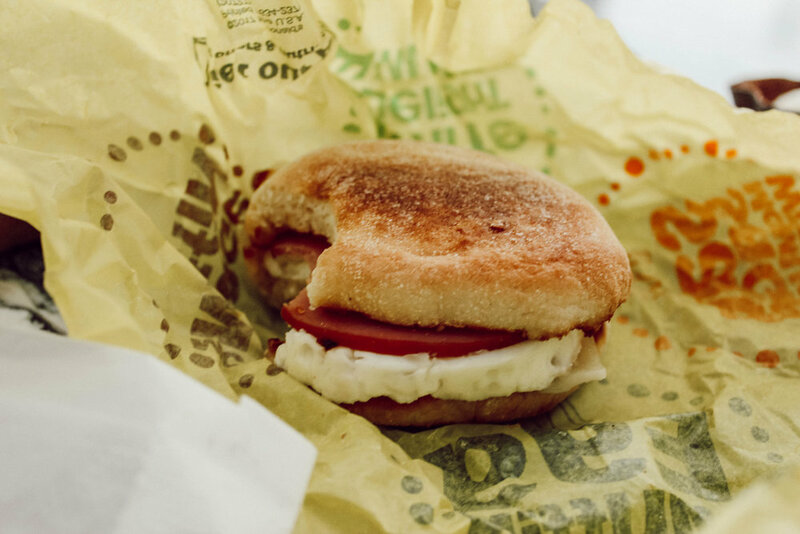 McDonald’s Egg White Delight English Muffin: I was pleasantly surprised by this McDonald’s breakfast sandwich. I don’t have a McDonald’s in walking distance, so I Postmated (this is officially a verb now in case you didn’t know) it and OH MY GOSH it cost me $14. Fourteen dollars. Can you imagine? I deleted my Postmates app right after. I am on Postmates Probation. This english muffin was fine, nothing to write home about, but the egg and turkey bacon tasted really fresh (I’m guessing they’re not as fresh as they tasted) and delicious. Now I get why people like McDonald’s…scary. 6. Starbucks Reduced Fat Turkey Bacon + Cage Free Egg White Breakfast Sandwich: Disappointed. This one tastes pretty similar to the McDonald’s version, but it’s much more bland. Not impressed.